Today, the very first classes came to participate in International Dot Day lessons. 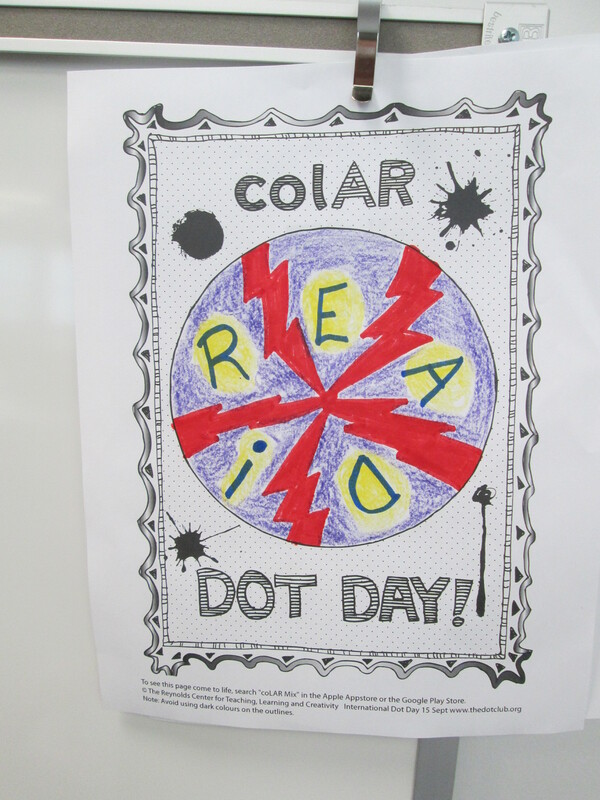 Ms. Olin’s 5th grade class read The Dot by Peter Reynolds. We talked about what it means to make your mark on the world. I loved hearing their ideas because they really had a sense of how they could make a difference. I had 2 separate areas setup for them. One area had coffee filters, a variety of coloring supplies, a water bottle, and tables covered in black butcher paper. They could use the materials in any way they wanted to be creative making a dot. 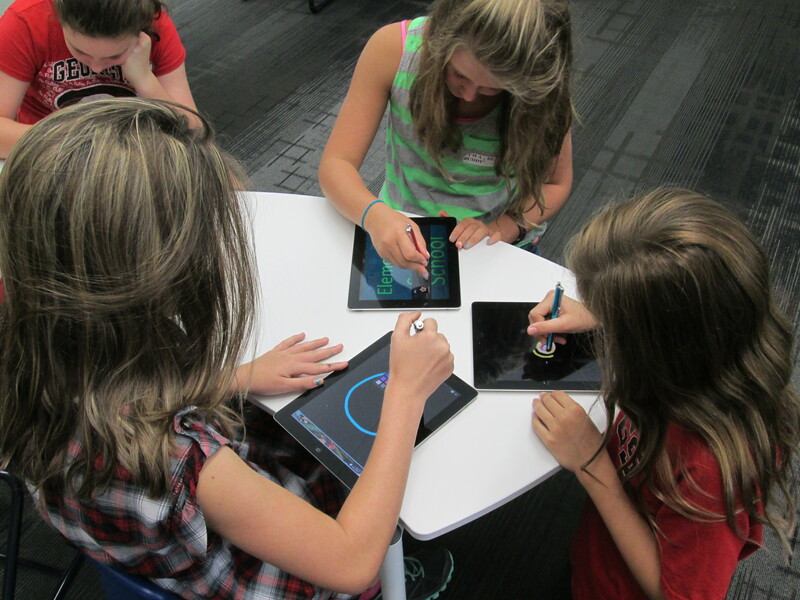 The other area had iPads loaded with Glow Coloring and Drawcast. Students who chose iPads used a stylus to draw a dot and save it to the camera roll on the device. Students chose where they went. I made no requirements about doing a dot at both locations. Some students chose to make several coffee filters dots by trying different techniques of using markers, crayons, color pencils, and water. Others chose to make multiple iPad dots. A few chose to do both. 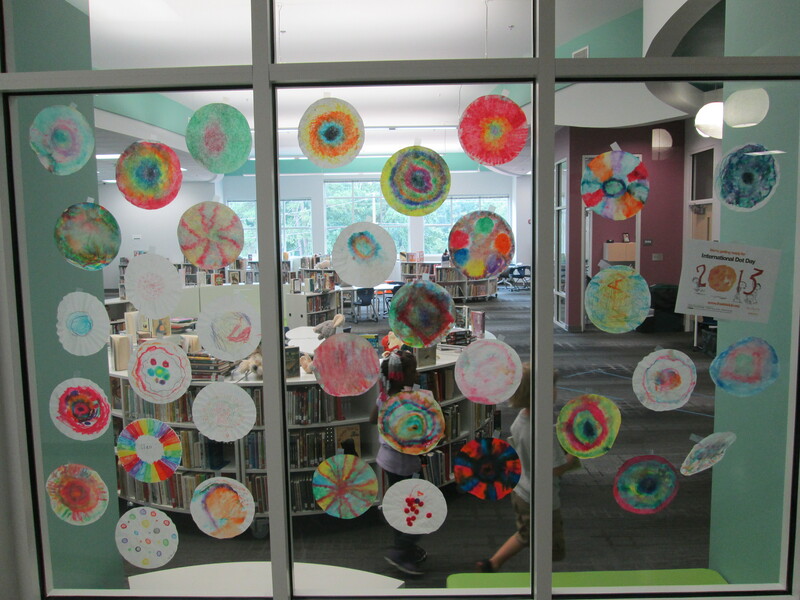 Once students’ dots dried, I started making our dot gallery on the windows of the library. Later in the day, Mrs. Kelly Hocking’s Kindergarten class came to begin a dot project. They are going to be studying several artists and learning how they can express themselves through art. One of the artists they will learn about is Chuck Close. This is a perfect tie-in to Dot Day since Chuck Close creates paintings that are made of numerous dots that come together to make a larger picture. I had already read Sky Color to her class and they became very interested in painting murals. Today, I showed them pictures of a mural in my daughter and son’s room and how the idea for the mural came from several children’s books. 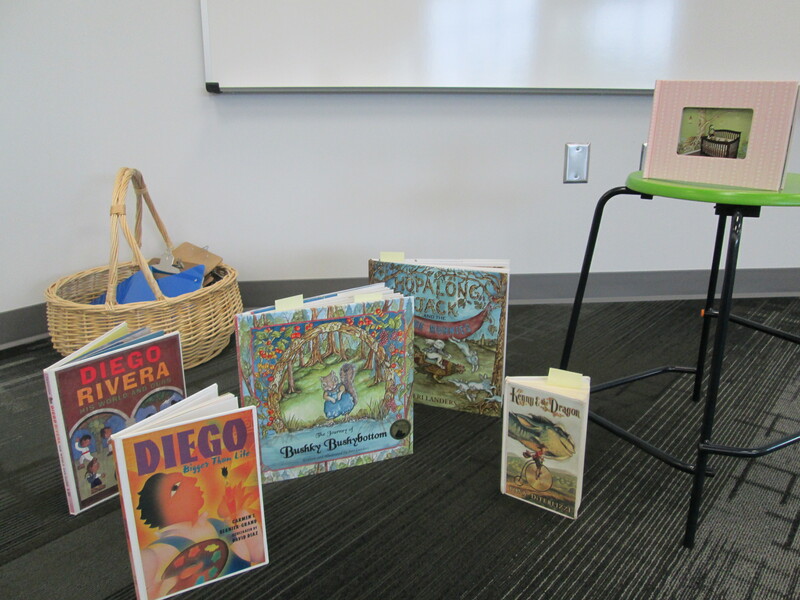 Then, we read Diego Rivera His World and Ours. The book details how Rivera traveled Mexico to get ideas for his murals. It also raises the question about what Rivera would paint if he were alive today. I love that the book ends by saying, “Today Diego is not around to make this happen. So it is up to us to make our own murals and bring them to life.” This was Mrs. Kelly’s lead-in to the mural that they will now create using dots in their classroom. The mural will be displayed in the library, and we will probably have some more lessons before it is done. I also discovered a great new iPad app after reading about it on Fablevision. 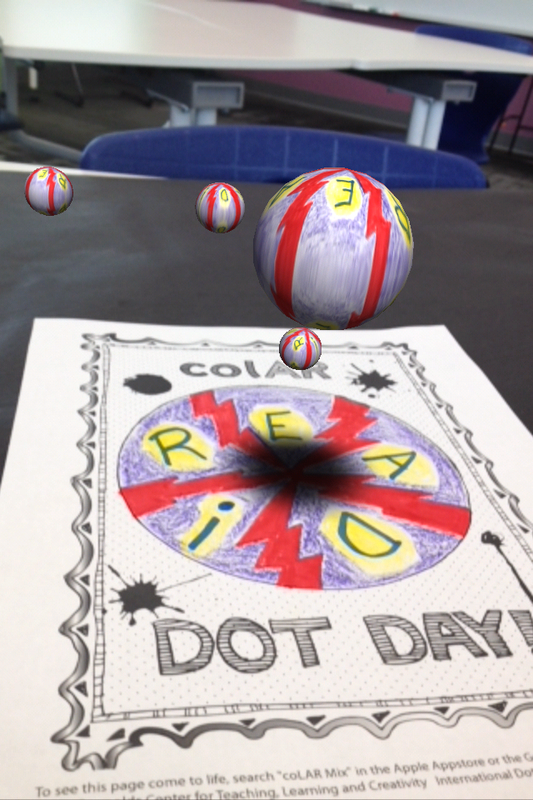 colAR Mix is an augmented reality app that brings coloring pages to life in 3D. They have made a special coloring page just for dot day. I made a practice dot, and it was so much fun seeing it pop off the page on the iPad. You can take a picture of your 3D dot and save it to the camera roll. I’m sure several classes will try this one out. These books will all be gone tomorrow! I love our local bookshop, Avid Bookshop. 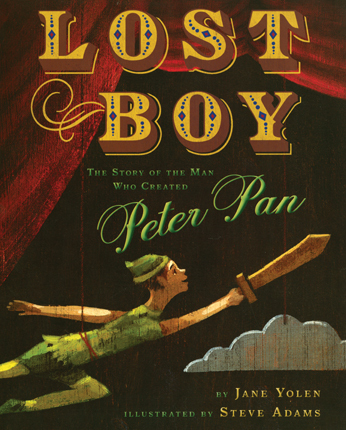 Over the summer, they contacted me about a possible author visit prior to the Decatur Book Festival. This book festival brings in some of the top authors from around the world for 2 days of book celebrations. This festival is actually connecting us with 2 authors in the 1st three weeks of school since they will already be in Georgia! Today, thanks to Avid, Gennifer Choldenko visited our 4th and 5th graders. Gennifer is the Newbery Honor award-winning author of the Al Capone series, Notes from a Liar and Her Dog, No Passengers Beyond this Point, and more. 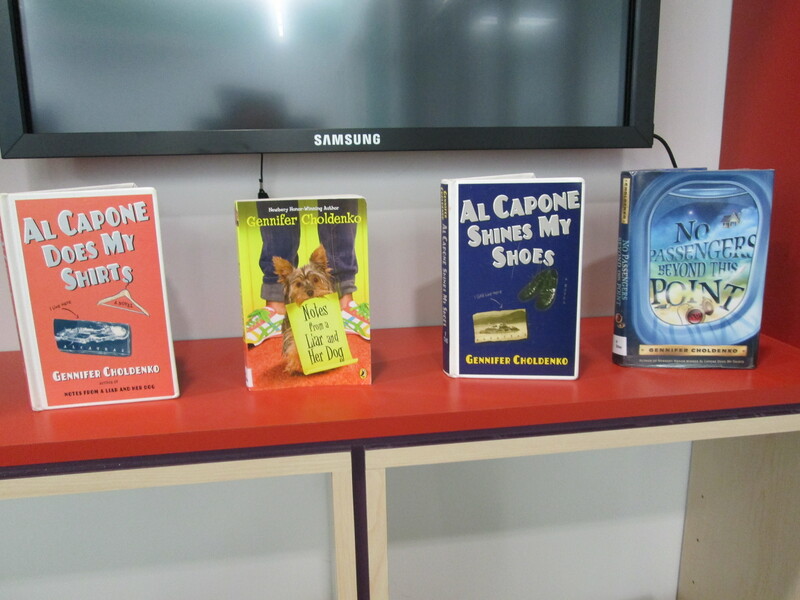 Before her visit, I held a session for all 4th and 5th graders to get familiar with her books as well as the book of our other visiting author, Barbara Walsh. 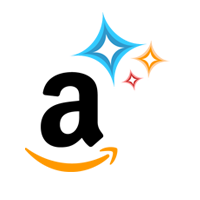 I used two different Blendspace (formally Edcanvas) links to share excerpts from books, book trailers, and biographies of the authors. Students also had an opportunity to pre-order books for signing. details of what she learned about Al Capone while he was a prisoner. Her photos of his prison experience with antique furniture was amazing! what historical fiction is…..like can you include an iPhone in a story set on Alcatraz? how many books she is in the process of writing. She’s a busy person! Gennifer spent time before and after her talk chatting with students. Love this! 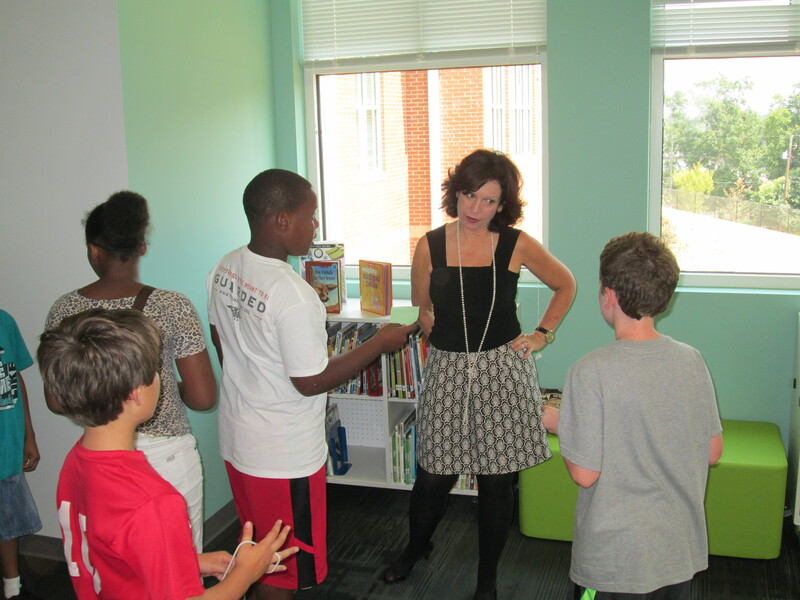 As always, the kids left this session pumped up about reading an author’s books. I have no doubt that kids will be knocking on the door in the morning to get these stories. I can’t thank Avid Bookshop enough for making this visit happen for us and for Chase Street Elementary. Bringing in authors is always inspiring, but it’s also very expensive. Having the support and connections of our local bookshop is fantastic! Also, a huge thank you to Gennifer Choldenko for sharing her time and talents with our students. They were so engaged and probably could have asked questions for another hour. All of our library copies of the books were signed. I’ve always wanted to try something different for library orientation rather than have the students sit on the carpet for 30-45 minutes while I talk on and on about how to use the library, check out books, and take care of books. This year, especially, I knew that students would be eager to explore their new library space rather than sit and stare at it from a distance. 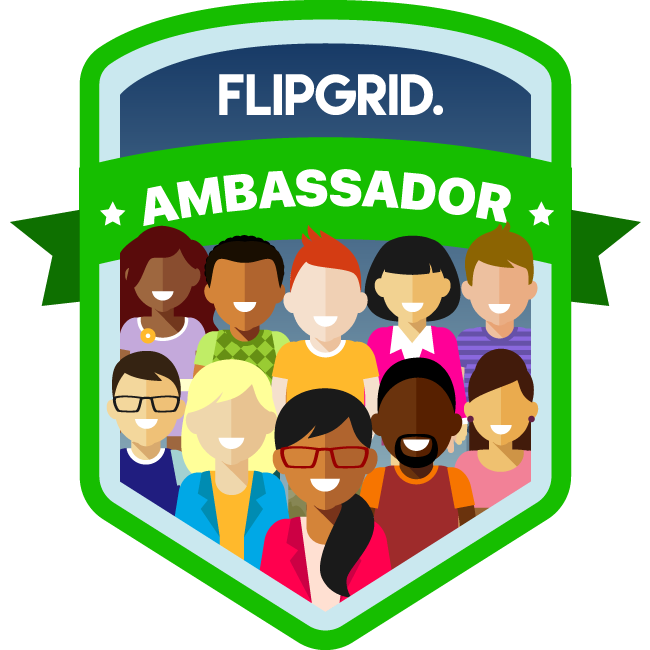 So….I made a plan for 2nd-5th grade and a plan for K-1. For K-1, we stayed as a whole group and watched a few of the videos together. I may try letting 1st grade scan one of the QR codes just for practice, but I felt like whole group with a story was still the way to go for the younger students. We read the book Sky Color by Peter Reynolds to make connections to the library being a place to be creative and think outside the box. For 2-5, I made a list of the major topics that I wanted students to think about when learning about the spaces in the library and the basic functions such as checking out a book. From there, I made a video for each of those topics using an iPad and uploaded it to Youtube. I took each link and generated a QR code. I put each QR code on its own piece of paper with some brief instructions. For example, the check out QR code said to scan the code and go to the circulation desk before watching. On our iPad cart, I downloaded a QR reader and tested all of my codes to make sure they worked. During orientation, I put out the QR codes that I felt like that grade level needed the most. 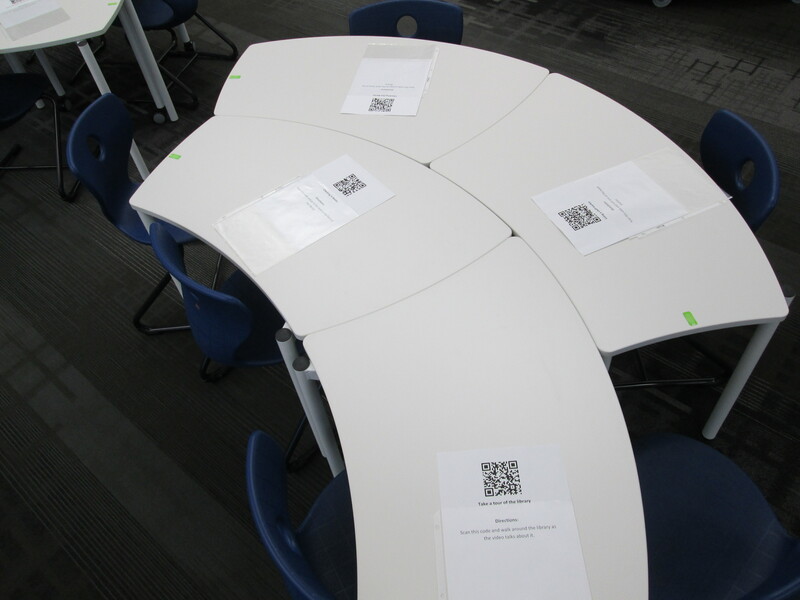 Lower grades had fewer QR codes to scan while the upper grades had them all. For some classes I made a table of codes that were the “must scan” codes and then a table of codes for “if you have time”. We started our time on the carpet in order to do a welcome, refresh using iPads safely, and to demo scanning a QR code. 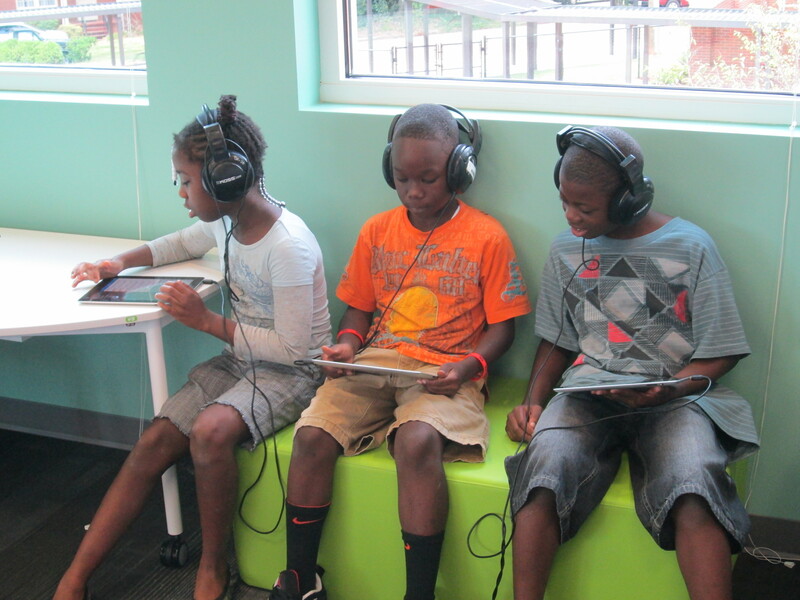 Next students got an iPad and plugged in some headphones from the library (or their own) and began scanning codes. 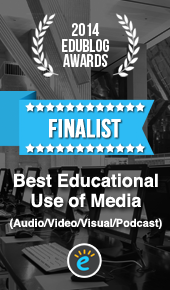 I would love to say that it was perfectly smooth, but of course students had trouble adjusting sound, some headphones weren’t plugged in all the way, and some headphones weren’t working. However, once the glitches smoothed out, it was amazing to see students productively wandering around the library with iPads doing a self-guided tour just as they would do in a museum. 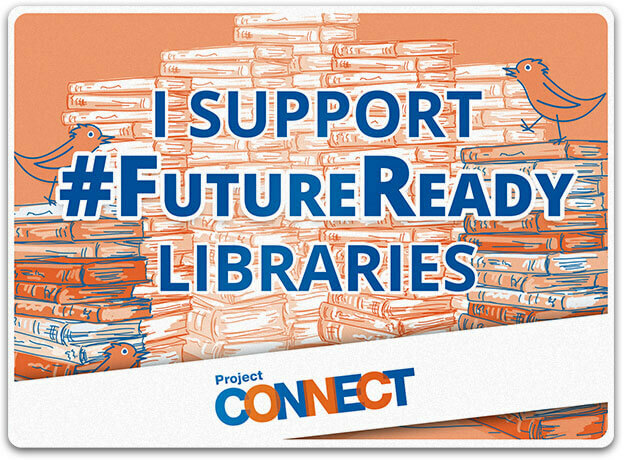 In the process, they walked the entire library, tried out multiple places to sit, found out about technology they would use throughout the year, and saw books that they wanted to checkout. I felt like even though they heard the same information each student gained something different out of the orientation. At the close, we came back together to share some things that they learned about our library. 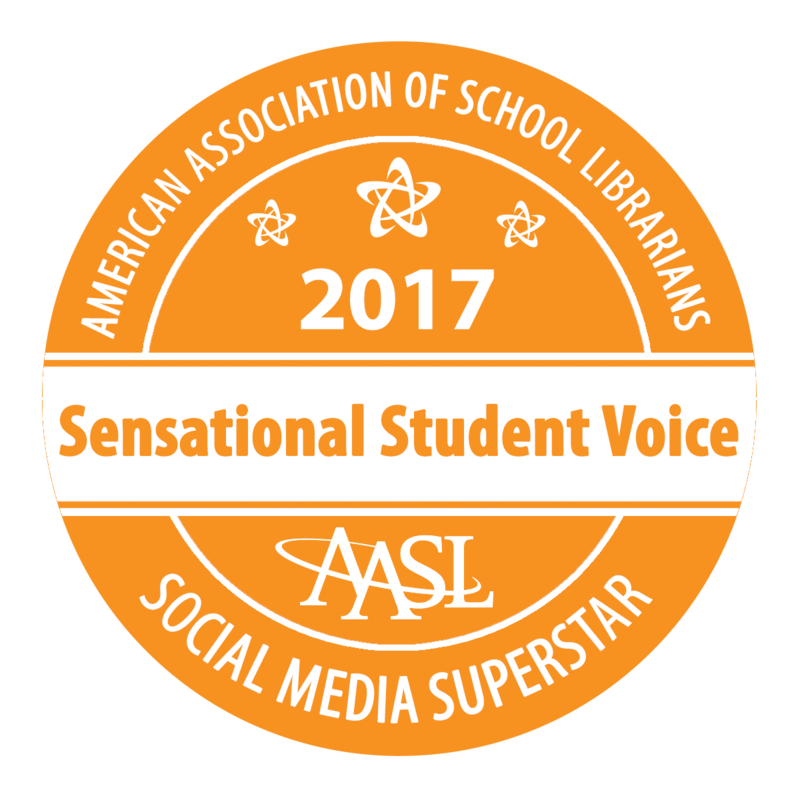 I wish that we had more time for this reflection because it gave me so many insights into what students valued in the library and what they were still wondering about. At checkout, I saw students doing some of the exact same things that I did in the video. I also saw students looking for books that they saw on shelves in the videos. Overall, students got a lot of the same information, but this was much more engaging, involved movement, and gave students the option to watch something again if they didn’t understand. We’ll see how this translates into library use during the year, but I felt much better about how this new take on orientation went. Today was exciting. For the first time, I saw 2 years of planning a library space begin springing into action. I saw how much the students are going to move this furniture around to meet their needs. I saw how visible the books were on the shelves, which leads me to think we’ll have even more circulations this year. This was only day one of classes. I can’t wait to see how the space grows, evolves, and becomes useful to the students and the kinds of learning they will take on for years to come. 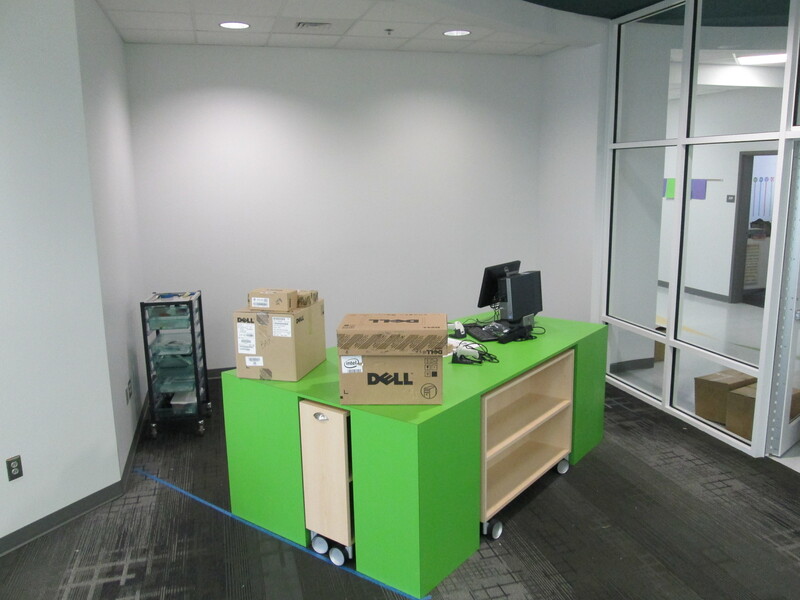 It’s hard to believe that the unpacking and arrangement of our new school library began only one week ago! As of today, every box has been unpacked thanks to many hours of work from me and some dedicated volunteers. This included working on 2 furlough days and the weekend. There’s still a lot to do, but it’s nice to know that everything has been unpacked! Create some type of signage to help students in locating the books they need. I may get students involved with this piece soon! 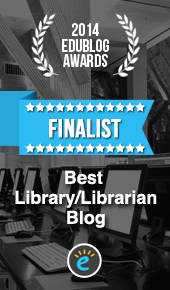 Today I want to highlight some of our areas of the library that I haven’t talked about yet. One is circulation. Throughout the planning of our library, I repeatedly said that I did not want a circulation desk. We don’t have a library paraprofessional at the moment, and even if we did, we don’t sit behind a desk all day. Instead, I wanted a self check-in area and a self check-out area with places for students to easily store books that were checked-in. We went through many rounds of discussions and drawings, but this is what we came up with: a circulation island. As students enter the library, they will turn right, check in their books at the check-in computer, and store their books on one of two rolling carts stored underneath the circulation island. If both of these carts fill up, a third rolling cart can be pulled out to replace one of the filled cart. This third cart also stores within the island. Once students find their books, they will stop by the opposite side of the island to check-out their books as they leave. On the wall right behind the island, there will be casework with multiple opportunities for displaying student work and books. There will also be a touch screen where students can browse the ebooks in our collection. I hope that this becomes a user-friendly area for our students. Another item I want to feature in our library is the multiple ways that students can sit and interact with the space. The curves of the shelves provide opportunities to put stools, bean bags, or soft curved seating. 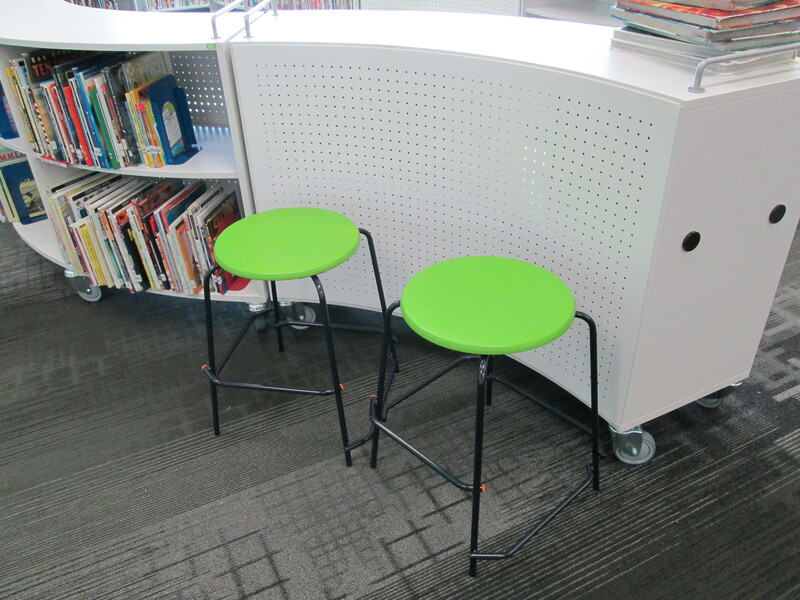 With stools, students can sit and read or they can face the shelf and use it as an additional workspace. As I display books on the tops of shelves, I’ll try to leave spaces open so that students can take advantage of these workspaces without having to move all the books. 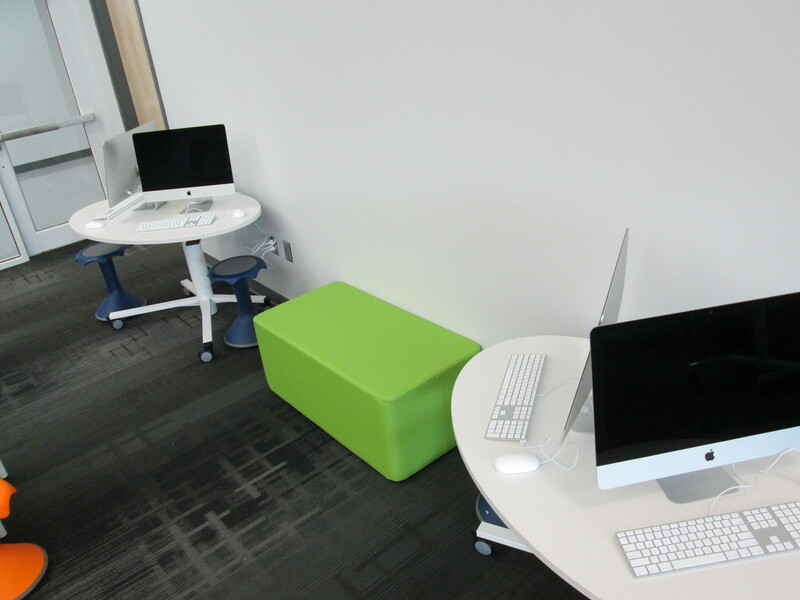 At our iMac video editing stations, students can sit on the rectangular soft seating, wobble around on a Hokki stool, or pull up a chair that can face forward or backward. It will be interesting to see which seating gets used more than the other. There are many more features that I look forward to sharing in the coming days and weeks, especially as students start to use them. Seating next to hallway. Games stored in cubbies. Soft seating fits inside the curves of the mobile shelves.